A new study released today measuring Facebook trends among various nonprofits – including the Planned Parenthood Federation of America, AARP, US Fund for UNICEF, and the Humane Society of the United States – revealed that animals are at the top of the food chain among Facebook’s nonprofit fan pages. 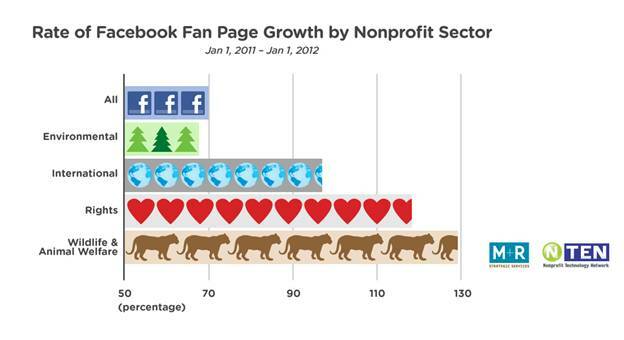 Overall, Facebook audience growth among nonprofits soared 70 percent last year but nonprofits in the wildlife and animal welfare sector reported on average that they had 129 percent more fans by the end of 2011 than the beginning. In 2011, monthly fan page churn – the rate at which followers become unreachable in a month – was low, at 0.5%. To read the full study, visit M+R’s Facebook page. You can download this year’s eNonprofit Benchmarks Study and last year’s Benchmarks Extra: Facebook report at www.e-benchmarksstudy.com.